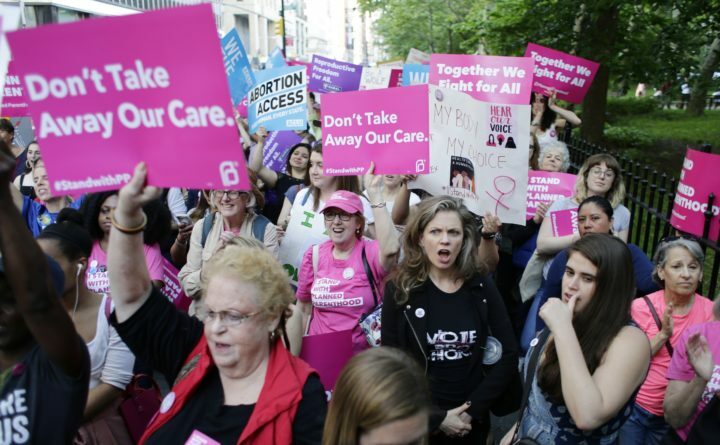 Supporters of Planned Parenthood react to speakers at a rally, Thursday, May 24, 2018, in New York. WASHINGTON – The Trump administration issued a rule on Friday barring groups that provide abortion referrals from participating in the $286 million federal family planning program – a long-expected move that would direct money away from Planned Parenthood and towards faith-based providers. Under the new mandate, which opponents have vowed to challenge in court, federally funded family planning clinics could no longer refer a patient for abortion and would have to have to maintain a “clear physical and financial separation” between services funded by the government and any organization that provides abortions or referrals for abortions. Recipients of grants under the Title X program, which serves mostly low-income women, were already prohibited from performing abortions with those funds. The change has been widely celebrated by social conservatives who oppose abortion and helped elect President Donald Trump. Health and Human Services officials have said the change is necessary to ensure transparency and the legal and ethical use of taxpayer funds. Critics have decried the change as a “gag rule” that would undermine the doctor-patient relationship. They’ve also described it as an indirect way to defund Planned Parenthood, which has long been a target of anti-abortion activists as the nation’s largest provider of reproductive care services, including abortions. Washington State Gov. Jay Inslee and 14 of his fellow governors have denounced the proposed rule and threatened legal action in order to block it from going into effect in their states. “The administration’s action will do irreparable harm to the public’s health and damage the network of highly qualified family planning providers across the country,” Clare Coleman, president of the National Family Planning & Reproductive Health Association said in a statement. The rule is expected to result in a dramatic change in the type of information the roughly 4 million women participating in the Title X program receive. Some of the faith-based groups advocate “fertility awareness” or the rhythm method and abstinence as methods of preventing pregnancy. In November, HHS, issued a funding opportunity announcement for Title X that elevates natural family planning and abstinence counseling as program priorities. Democratic members of Congress last week objected to what they have called an “unconventional and nontransparent” review process for the rule and called on the Office of Management and Budget to send it back to HHS for more analysis. In a Feb. 15 letter, Rep. Elijah Cummings of Maryland and Senators Patty Murray of Washington, Kamala Harris of California and Maggie Hassan of New Hampshire called out HHS for taking numerous shortcuts. When the proposed rule change was first announced in May, the White House said only clinics with “a bright line of physical as well as financial separation” between Title X programs and those that support or refer for abortion would be eligible. The rule was modeled after requirements adopted under President Ronald Reagan but never enforced. The Trump regulation does allow for a limited exception to the referral ban. If a pregnant patient has decided to have an abortion and makes an explicit request for a referral, a doctor would be allowed to provide a list of comprehensive care providers as long as she or he does not indicate which of them offer abortion services. In an interview earlier this year, Planned Parenthood President Leana Wen said the group could not accept funds under those conditions because it would compromise its ethical obligations to its patients. Planned Parenthood serves about 41 percent of Title X patients and receives about $60 million from the program. “I want people to think about what if this were any other aspect of medical care – imagine if the Trump administration prevented people with diabetes from talking to their doctors about insulin,” she said. The rule takes effect 60 days after it is published in the Federal Register. However, clinics will have 120 days to comply with the requirement that family planning and abortion services are kept financially separated and a year to comply with the physical separation requirement. The administration has implemented a similar rule – nicknamed the “Mexico City gag rule” – for grantees of U.S. foreign aid that prevents organizations that get those funds from referring, providing or discussing abortion with patients.